Downtown Pittsfield - Saturdays 9-1 (Summer) or the second Saturday of each month during the winter we'll be indoors at the church right next to the Common, so you'll park in the same spot as during summer! Berkshire Grown Markets - Gt. Barrington 11/17 and 12/15/18, 10-2 and Williamstown on 11/18 and 12/16/18, 10-2. Handmade Holiday Festival - Stationery Factory, Flansburg Ave, Dalton. Saturday and Sunday, 12/1 -12/2. Holiday Shindy - December 8th, 10-6 and 9th, 11-4 in the Shire City Sanctuary on Melville Street in Pittsfield (next to the Boy's Club). Sheeps & late spring mayhem�. Posted 5/27/2009 2:57pm by Desiree & Jesse Robertson-DuBois. The days grow longer here at the farm and we have trouble coming in from the fields when the weather is warm. The spring ephemerals are blooming in plethora and we have carpets of trillium, trout lilies and ramps growing out in the woods. We’ve been eating lots of ramps- Jesse made a pesto from them that we were still tasting a full day later. Mostly we eat them gently sautéed with a drizzle of balsamic and maple syrup or mixed into our morning eggs. They don’t last long, so they are a real treat in the spring. We haven’t yet found any beds of lady slipper, jack in the pulpit or (alas) morels. But we carefully tend around our few bloodroot that have found their way into flower beds behind the house. After a winter of muted color, those first bright rays of spring are a true delight that are eagerly awaited. Our farm apprentices, Jan & Ian have both arrived and are settling in and we are very glad to have them. It makes everything so much easier just to know that there are extra sets of hands, ready and waiting, to help with even the simplest of tasks and even more so when the cattle get out and are feeling feisty enough to traverse the length of the farm despite the lush pasture they have right in front of them. Trays and trays of seedling veggies are filling and overflowing the two greenhouses. The first round of starts is almost complete and we are transplanting them out into the fields. Onions went out the first weekend, along with seven new beds of strawberries, potatoes were planted and we plan on putting in the first seeding of lettuce on Monday. The fields will rapidly fill up in the coming weeks until they too are bursting with delicious vegetables for the CSA and farmstand. This year we have started a lot more seedlings in order to meet many requests for transplants from our friends and neighbors who have gardens of their own at home. Our plant sale was a great success and we will definitely do it again next year, though we will plan for way more flowers and tomatoes (and hope that the mice don’t find the peppers and eggplant the way that they did this season, sorry folks) We still have some transplants left that we will happily part with such as broccoli, basil and other herbs, lettuce, strawberries, squashes and pumpkins and brussel sprouts to fill out your garden with delicious food and beautiful color. We got really excited about Eliot Coleman’s idea for quick hoops made out of electrical conduit and we applied the idea to make a shade tent for hardening off our transplants (the idea of lugging all those flats in and out of the greenhouse was exhausting). The conduit was leftover from the new wiring of the big greenhouse, all we needed was some short pieces of rebar and a piece of shade cloth conveniently borrowed from our friend Dave Burdick. It worked fabulously! No more lugging flats in and out to harden off, whoo hoo! Thank you Eliot! The CSA starts up on the second week of June. We still have a few shares left so tell your friends and neighbors about our wonderful farm share. The peas are up and growing and it won’t be long until their succulent little pods are ready for eating. Animal News: Lily, Tulip, Penny and Lucy are out on pasture, little ones will follow as soon as those who reserved piglets arrive to take them home with them. Pinky has had eleven healthy piglets and is happily ensconced in the barn for another three weeks or so. Then she too is off to the Christmas tree pasture with everyone else for the summer. Jake is soon off to visit Simple Gifts Farm in Amherst to service a few ladies for them. He’ll be back in a couple of months. We have a brand new addition to the horse paddocks. Long-legged Skye was born on April 23rd right here at the farm at 8:05am on a gorgeous morning. She has a lovely creamy brown coat, dark legs, tail and mane with a perfect dark dorsal stripe down her back. Take care around her momma, Cookie, though since she is very protective and has a tendency to bite or kick at anyone who gets too close to her little one. Viewing is fine as long as you stand back from the fences and keep your fingers out of the grating of her stall. Denise and everyone in the stable are working hard to get her to relax and not feel so threatened, but she’s still a little high strung. More Sheeps- Clun Forest beauties from Mary Gloster at Rocky top Farm in Groton, NY. We went to fetch them at the end of April and they are making their way around the farm. They have done a great job at mowing some of our field edges and around the pond (fertilizing the whole time and making for lush green whereever they have been). Our new girls are still a bit flighty and not used to the whole program, but Elsie and Bessie are showing them the ropes. Thank goodness for a solid older ewe who trusts humans. We are still looking for a nice ram lamb for the fall breeding, preferably a Border Leicester or Romney to add a little color and legginess to the Clun blood. The cattle began their tour of the farm in the Mitchell field next to the compost site but have finished it in record time and are ready to move all the way back across the farm so that we can get them marching along in front of the sheep. The sheep have not been as happy munching on the grass in the last two weeks since it is all tall and stemmy, but the cattle prefer it that way and are happy to munch it down to the 6 inch level and leave the rest for the sheep. Once the fields have been mown of the first cut, then the sheep will be happier to eat softer, leafier second growth. So running them with the cattle would be the best bet. Education Program has a new name and has hosted two great tours/schools in the past month. We had a lot of fun with the kids, planting lettuce, starting seeds for a new school garden and showing off all our gorgeous animals. We’re looking forward to more tours in the next month, a sheep shearing demo and the planning of some practical rural skills workshops for the summer and fall. Posted 4/18/2009 2:11pm by Desiree & Jesse Robertson-DuBois. As you may have heard by now, this season’s maple sugaring was a bit of a bust. Turns out that since we didn’t have a January thaw this year (remember that frigidness?) the maple trees didn’t have their chance to concentrate those sugars in their sap and so when the sap started running in March, the sugar content was lower than usual making for longer boiling times, higher mineral content and hence, darker syrup. Now we don’t mind so much since we like the darker syrups, but there are going to be a lot of disappointed folks out there who like light or medium amber. This wasn’t just in our area, this was everywhere and contrary to popular belief, it had nothing to do with the ice storm, since we didn’t have any major damage to our sugar bush from the storm. So the sap started running and it was measuring at 1.5% sugar instead of 2% and we got dark amber which rapidly turned to B and then to what is called ‘commercial’ grade- syrup so dark and rich when it came out of the evaporator that it looked like motor oil. Of course, we love it since we can’t get enough of that delicious maple flavor, and, it turns out, we have some customers that are delighted that we have it this year (we usually don’t offer it- it goes into 5 gallon jugs and is shipped off to a wholesaler). In any case, we’re going to bottle some into ½ gallon mason jars and quarts, so if you like it dark, come on by. The only really disappointing part of this sugaring season is that we didn’t get as much syrup as we usually do (no one did, so expect prices to soar) and we’ll most certainly run out before the end of the year. Animal news; We’ve got sheep! Yep, Holiday Brook has finally gotten sheep and no one is more excited than Pippin. Turns out she’s a sheep dog after all. She’s o.k. with cattle and hogs, but she’s made her preference really apparent in the last couple of weeks since our ‘starter flock’ of two ewes and four lambs arrived. We think that she could live in the barn as long as she could watch the sheep all day and if she disappears, well, that is usually where she can be found. She and Des are still floundering their way through learning each other’s language, but together they are learning to work as a team and are starting very small so don’t expect to see them at any herding demos in the near future. Elsie and Bessie are two grade Romneys (meaning mostly Romney with a little bit of other breeds mixed in) and they came from Crabapple Farm in Chesterfield. Elsie is actually Desiree’s original bottle lamb that she bought (along with Elsie’s sister Charlotte) from Hampshire College 5 years ago. Now Elsie has come with her 3 year old daughter Bessie and their lambs from this spring. Elsie has two daughters this season, Flower (silver and black) and Sprite (white with red ears and legs) & Bessie has a daughter, Cleo (a deep chocolatey black/silver) and a boy, Leo whom she rejected- which is supposedly something she did last year as well- but that Des and El and Morgan (and sometimes Jesse in a pinch) have been bottle-feeding. Leo has ensconced himself into the hearts of the kids and since we’d like to find a nice ram and some more lovely ewes to start our breeding flock, Leo might just find himself designated as ‘ram’s best buddy’ and prized for his gorgeous coal black fleece. All the new heifers are named: Sweet as Milk, Cocoa, Sugar, Treacle, Eclipse & Trickle. As I said before, it took until it was actually warm enough in the pasture for us to stand around scritching them and figuring out their identifying markings especially for the two that always seem to be hiding. All the cattle have grown quite a bit over the winter on our delicious second cut silage bales. It has been quite shocking to stand with what used to be little 7 month old calves and are now yearlings and have them be so big. They still look adolescent but are coming along nicely. River, Froth and Brook are definitely pregnant and are looking very round already, but calves aren’t really expected until July at the earliest. Penny had her second litter and she is proving to be just as great a momma as her mother, Pinky. She only had 11 babes this go round, which is fine by us. She is gentle and nurturing without being nervous or aggressive so she is definitely going to be a keeper despite the fact that she is not exactly what we were looking for in conformation (being shorter through the body). Still her good mothering, heath and gentleness are higher on our list of breeder priorities since we don’t like angry, aggressive mothers (these are big animals with sharp teeth and they can do serious damage if they don’t like what you are doing). We had some overcrowding in the barn, except for mommas and babies, but we decided to sell a large number of partly finished hogs to a farmer in VT and so the barn is cleared out. Everyone else, except for Pinky and Penny will be moving out onto pasture in short order now that the new area is cleared, fence is built and their house has unfrozen from the winter pasture. The new chicks are getting bigger and there have been no weird illnesses this year like last season’s fiasco. They will be moving out of their brooder shortly and into the main area of the stall that they are currently in (thank goodness they aren’t in my basement again this year). We will be building some roosts and hoping that that will solve the ‘roosting on the ground’ problem that we’ve had several years running. We have always assumed that the inclination to roost as high as possible was biological, but we haven’t experienced that. The last few years we’ve found that they ignore the roosts and prefer to roost on the ground underneath the mobile units instead of inside no matter the weather, the predators, et al. We’re hoping that by building roosts into this transitory space before they move into the mobile pasture unit will result in birds more likely to want to be inside at night and hence, safer. I got rather tired of going outside every night for the first month and beyond to drag birds out from under the house and tossing them inside onto roosts. Farm news: The fields are greening up out there. A few more days of warm weather and we’ll be scrambling to get all the animals moved out of winter pastures and onto fresh grass. The smell of rich soil turned over to make vegetable beds will soon permeate throughout the farm, we could have started last week in some fields, but they aren’t designated for peas or spinach, so we’ll just have to wait. A weasel has made himself at home, probably in the pig barn where he consumes small furry rodents. We think he is also responsible for killing chickens here and there (and maybe even for the mass slaughter of 16 birds last autumn, but we’re not sure about that one). We are weighting the balance of whether or not to let him remain here- he has gotten pretty comfortable around humans, which is not such a great thing, but he also takes out more rodents than the cats do. Our big worry is that if he leaves, another weasel may decide to move into the territory and decide that they like chicken a whole lot more than rat. So far, we’re accepting the gamble. Veggie news: The small greenhouse recently got a new layer of earth-mat. We had mistakenly thought that is would be a grand idea to put five gallon containers of used fryer oil in the greenhouse for the winter so that they would have a chance of melting during sunny days and then we could filter it and have it all ready for the late spring/summer months when we use it in our tractors. However, I guess we just didn’t get to it enough and the rodents were very grateful for the high calorie nutrient source. They chewed little holes in the jugs and voila, used grease all over the floor of the greenhouse. YUCK. Cleaning it would have been a chore in itself and wouldn’t have dealt with the awful smell or the fact that the oil had soaked into the soil underneath. So we moved out the benches, ripped up the old floor, re-graded and even put in a little better drainage, and put down new mat. It looks great, was a fun team effort (that unfortunately had to span two weekends since I screwed up the earth-mat order) and the greenhouse got a good overall in the process. In between weekends we got all the alliums started and they are up and growing well. We are even trialing our own potting mix (made with our black gold compost) and it seems, so far, that those alliums are doing as well as the ones in the standard potting mix that we usually buy in. we’re using a standard Eliot Coleman recipe which is good for making soil blocks, only we add a little more compost than peat moss since we have lots of it. The new Modine heater is going into the big green-house and some repairs are getting made to endwalls (we’re replacing the plastic which was only supposed to be temporary, with wood). The big house will be up and running in the next week which is just about the time when we run out of space entirely in the small house as Dave Burdick moves ‘Florida’ in (his shipment of bromeliads, specialty tropical ferns and other lovelies arrives making it look like a tropical paradise in the house). The CSA is filling up fast, there are only about 25 shares left, so if you have been thinking about it, get your sign-ups in quickly. We are planning a large Plant sale for the week-ends of May 16th & 23rd. Come by the farm to pick-up all your garden transplants. We’ll have a host of heirloom tomatoes, herbs, flowers and others. Compost is being screened and is ready to go! Our beautiful black gold (or brownie mix, whichever seems more wonderful to you) is ready to make your gardens and lawns gorgeous. We deliver in bulk or you can pick up bags here at the farm. Give us a call. Posted 3/9/2009 2:32pm by Desiree & Jesse Robertson-DuBois. So many people ask us what we farmers do in the wintertime and assume how we must really enjoy our ‘break’. We beg to differ. While it is true that we try to not spend every waking moment of daylight outside during the dead of winter, we are still very busy and often feel pressed for time and behind schedule. The animals still need feeding everyday and this is much harder in the winter. Logging can really only be done well in the winter when the ground is frozen hard. And we still need to be planning for the coming season in addition to catching up on all the paperwork, invoicing and book-keeping (among other things) that we’ve put off during the warm season. Winter is when we hire apprentices, remake brochures, plan field rotations for animals and vegetables, order seeds and so much more. Of course, I can also make bread while doing these things, but I can’t necessarily find time to clean my house. Ah well, we must all have priorities. Still I should have had more than enough time to get to writing up a new Bull, but it really isn’t all that exciting to talk about all the taxes and paperwork that we’re getting done so I figured I’d wait until things started to gear up again for more charismatic work. Maple sugaring: So we got all tapped in during February break thanks to Jonathan Sawtelle’s hard work in the sugar bush. Jesse was able to get out there for two days, but then just turned Jon loose and he got it done. We’ve also got our friend Masato out installing a whole new branch line with 200 more taps. The ice storm in January knocked out our uppermost branch line, so we’re replacing it with this new line which is further down the mountain and so a little less steep and prone to squirrel and ice damage. We’re all set to sugar- we even got 500 gallons of sap in a short first run that is sitting in the storage tank frozen solid. This winter just seems to be dragging on but hopefully will soon let up on us enough to let the sap run and we’ll have something for all those school groups to see when they visit. Animal news: The critters have all weathered this cold and snowy winter very well. The cattle actually enjoy this bug-free time and have been loving the silage that we made during the summer and which has been happily pickling ever since. The pigs (yes, even the ones out in the field) sailed through the winter and got very fat in the process. We had a lot of folks asking about how they were fairing even in the sub-zero temp days and truth be told, unless you are a chicken, you were just fine. Penny got the tiniest bit of frostbite on one ear on a particularly cold night because she forgot to tuck herself all the way in to her bedding. Only the chickens suffered any loss at all and that was to some of the roosters very large combs (I will state that I specifically order small comb chickens for this very reason, but I always end up with some ‘substitutes’ in my order) who lost some of their combs to frostbite. Since the last edition of the Bull, we’ve also added 6 new lovely heifers to our herd. They are from Wheel-view Farm just like our four other foundation Galloway/Highland crosses and they are just as beautiful. Born in April of last year, they are just under a year old. Most distinguishable of the six are a white Galloway that Morgan named ‘Sweet as Milk’ and ‘Chocolate’, a deep brown girl with a wide white belt. The other four girls are all blacks with varying white belts. Three remain un-named which we will fix once it is not so cold to stand out with a camera. The other is Eclipse, for her white belt with a large black spot inside it. Lucy had her second litter in the barn- nine healthy babies, all strong and vigorous. One of Lucy’s daughters, Tulip, from her first litter is staying with us and one of Pinky’s girls, Lily, from her third litter. So we have two new big girls in the barn on which to lavish a lot of attention. The pig barn is looking a little crowded right now with thirty large weanlings growing in it which is one of the reasons for building the new barn this spring. These guys will go out as soon as we can get the fence up around the area where they will be spending the spring. They will be renovating the old Christmas tree paddocks this season. We are finally getting some sheep! We’ve been bottle feeding a couple of lambs for a neighbor while he was away and the kids just got so into it that when Crabapple Farm over in Chesterfield called us and asked if we wanted to buy some Romney cross ewes and their lambs we said Yes! Coincidently one of the lambs was rejected by his mother and now we are bottle feeding the little guy. He’s all black and we’ll have to get some pics of him for you later (it is difficult to get good ones of a black lamb while in the barn). The pictures of the little white lamb is the one that belonged to our neighbor and he has gone home to his flock where he is thriving and jumping, leaping and playing with all his flock mates. Logging: Dicken has been logging hemlock and red pine out of the thirty year old plantation behind the farm. Mountain bike racers will no doubt notice when they start riding again in the spring. Dicken has left some gorgeous hardwood ‘seed trees’ such as beech, cherry and maple with the vision of recreating the hardwood forest that belongs up there. Unfortunately the market for logs of any kind has hit rock bottom in the last couple of weeks, so we’ve temporarily halted logging for a while in the hopes that it will pick up again soon. (I have some great pictures but I need to convert them to jpeg before I can get them up here, check back later). New Apprentices: We’ve hired a couple for the summer apprenticeship positions, Ian Peach and Jan Buonanno. Ian is coming to us from California, while Jan is from Albany, NY where her father runs a specialty butcher shop. They will be living here at the farm from April through November and participating in all aspects of the farm. Jonathan Sawtelle will also be rejoining us for his third season on the farm (not that he ever really left since he works part-time year round in addition to schooling). Kristen Laney (with baby Nora in tow) and Caity Delphia will also be back as part-timers on the crew- it looks like it is going to be a fun summer. CSA and Veggie News: CSA sales are going well with us reaching the half way point a month and a half after brochures went out. The downturn in the economy is definitely hitting people hard, but it seems like most folks are returning and there will be lots of new faces in the distribution room this summer. Our community is growing and it is with great pleasure that we watch this happen. We are starting up the greenhouse and will be mixing up our potting mix in the next week so that we can start planting the onions, leeks, shallots and celeriac. We are also going to be getting the big house up and running since we will soon run out of room in the little house and need more space. The big greenhouse still needs a heater and to be tightened up some before we think about putting tender baby plants in there. It also starts to move quickly from here though and spring and plowing will be upon us in just a few short weeks. Farm products: We now have our own grass-fed beef available in our freezers at the farm. It is all natural, no hormones or antibiotics, no grain. We have also just gotten back lots of our delicious pork. The freezers are full of tasty sausages, chops, ribs and roasts. The hens they are a laying and we have dozens of eggs for sale- you won’t find them in the office, it is still too cold and they freeze so you’ll have to come up to the house if you want eggs. Maple syrup is really low but we’ll soon be boiling and the shelves will start to fill up once again in just a few short weeks. Please be patient with us as we are just waiting on the trees. Posted 1/1/2009 1:40pm by Desiree & Jesse Robertson-DuBois. It has gotten cold in the last month. Putting our hands in the water to wash vegetables for the last few weeks of CSA have been quite a challenge, but we bought some neoprene gloves for our apprentices, Jan & Ian, so they will still like us when they leave. Fences are getting built. Barns….well, not so much. There have been a few obstacles in the way of timely barn building so far this year and now we are running out of time. We may still make some progress toward the overall project before the cold, wind and (gasp!) snow hem us in, but it looks like we probably won’t see those timbers going up until spring. The pigs probably won’t notice. They love their snug shelters piled high with straw on the inside, tucked out of the wind in the trees or down in a hollow. They are certainly fat enough after a summer of veggies, earthworms, and free access sweet feed. We took the CSA an extra week longer this year and are adding a special Thanksgiving distribution of whatever we have leftover. We’re very excited that we’ve been able to work out all the timing to bring this to our shareholders and hope to just keep making it better as time goes on. We’re trying some winter greens in our greenhouse over the winter to see how it all plays out. Yep. We’re going ‘Eliot’ around here. (so called for Eliot Coleman, the guru of winter harvests in the Northeast). If it works, next year we’ll offer some season extension share add-ons to our regular 20 week CSA season. We are starting our Meat CSA in November for all of you in cyberspace that don’t know about it yet. We are offering 10# increments of Pork or Beef or a Combo for now (we’ll add lamb next fall). Call or email the farm for details. Pick-ups are the first or third Saturday of every month with all our other farm products being available for sale on those days as well (a mini-farm store with eggs, yogurt, breads, maple syrup and jams, etc.). We had our calves born in the last few months since we’ve written. Plus two litters of piglets born on pasture to first time mommas, Tulip and Lily. Tulip produced a litter of seven of the cutest piglets we’ve ever had, including three all black (they look like the infamous Berkshire pigs that are all the fashion in meat these days), three spotted with red guard hairs and one lone all pink. All of Lily’s brood are as pink and spotless as they could come. We still can’t figure out the genetics on these guys. In any case, they are getting bigger now and are running around like mad making trouble hither and yon around the fields. Their fence has never been all that ‘hot’ so they have decided that a little shock is worth it for the adventures that lie beyond. Thank goodness for tolerant and level headed horses. They no longer even acknowledge the little squealing rugrats that are milling about in their pastures even when they are right underneath them. The piglets love horse poo. warm. oh well. The sheep were not quite so thrilled to find them in their paddock as the sheep moved through, but except for a few frayed nerves and one final, ‘i’ve had it, i’m leaving’ from the flock (which took them further away and out of the range of piglet mania) everyone was fine. All of our animals are currently either moving through or are on the same large field and it has been really interesting to see the interactions between all the species. What is most fascinating is that the coyotes, who were singing and eating a chicken nightly have largely vanished from this field as soon as the cattle came in. That doesn’t mean that the cattle haven’t been making nuisances of themselves with the chickens- getting into their fence, eating their grain, occaisionally cornering one poor bird and chasing it in a gang from one end of the field to the other. Luckily no one has gotten hurt in any of this mischievousness, only stressed out and harried. Interspecies grazing is certainly something that we’ve been considering, we were just sort of hoping it would be a little more controlled. C’est la vie. What we have learned: Horses do not mind piglets or chickens and vice versa. Cattle and sheep ignore each other. Horses mostly ignore sheep. Sheep hate pigs. Pigs think sheep are funny. Cattle ignore piglets but think chickens are fun toys. Chickens do not like this. The dog finds it all very fascinating. We are borrowing a beautiful bull from Wheel-view Farm. A Murray Gray x Belted Galloway cross named Cook that is from the Goddard’s in Conway. When our hauler, Roberta, called to ask me about him and if he would be nice when we picked him up, my reply was that I didn’t really know, but that I figured if the Wheeler’s were buying him, he was probably almost as tame as a kitten. While I still wouldn’t turn my back when he’s out there with his ladies (cause that’s just irresponsible), the first minute I met him, he pretty much put his head in my armpit and begged for scritches. So. As far as bulls go, he’s a sweetie. He had a little bit of rough go at first with some of our randier steers (the smaller ones, of course). We kept a close eye, he kept his ground and seems to have established himself as top dog. He certainly bred Luna that first day, so we’ll be watching for a calf from her right off the bat next August. We’re getting ready to put ram Raven in with the ewes in the next few weeks. I have no desire to even see a lamb before the middle of April, so we are waiting until the middle of November to mingle. But we finished the new sheep fold in Cooper Barn (or rather, Jan and Ian, our fabulous apprentices made the sheep fold renovation happen while Desiree & kids were sick in bed with the h1n1 flu virus). It looks great and ready for bedding and sorting of sheep for breeding. We just need to build a winter paddock for them and it will be complete. We are running out of grass in some areas, but we still think we’ll get another month on pasture for everyone before we have to start feeding out hay. We even cut another field of haylage here at the end of October. It probably won’t be the best haylage we’ve made this summer, but it is still some and it is better than dry first cut for the pregnant cattle. We say good-bye this month to our wonderful apprentices, Jan & Ian. They were true shining stars and this season would have been very hard without them. They’ve made our third season on the farm a true joy and we hope that they had fun, learned a lot and go forth to their future knowing that we cherished their enthusiasm, warmth & kindness (not to mention their fabulous work ethic!). They go on from here to manage the Daloz CSA in Hancock, New Hampshire and we wish them happiness in that endeavor and all other future ones as well. We have no doubt that they will be successful and as loved by their new shareholders as all those they are leaving behind. Posted 12/4/2008 2:44pm by Desiree & Jesse Robertson-DuBois. As November turns to December here on the farm everything winds down whether we want it to or not. The days are short and bitter cold (with a beautiful warmer day here and there, where we scramble around trying to get all those little things done that we have put off). We’re still waiting for a good snow, which makes the cold more bearable all around. For parts of the farm, work is just starting up and getting going because it is work best done when the ground is frozen so that there is less damage done to fragile soils. Dicken is outside from dawn until dusk sustainably harvesting trees that become homes, furniture and fuel to heat our homes. Nothing ever completely stops on a diverse farm. The animals still need daily attention, for feed, water and well-being. And sugaring season is right around the corner. But, the vegetables are done, except for what is still in the root cellar, but the bulk of the remaining squash is going to be donated to the local food pantry in the next week or so, though the pigs have certainly been enjoying the ones that have not held up. Those of us who are vegetable growers, we use the cold dark months to reflect on the past season’s successes and challenges, to plan, to make bread and dream of dark earth, seeds and the fresh green of spring. We brush the dog, teach the children new games and open jars of canned tomatoes, peaches, and raspberries that smell like summer. We wish for snow so that we can be outside almost as much as we are when it is warm, and then we have a good excuse for drinking creamy cups of chocolate and dark sweet tea and standing close to the fire. Announcements: The apprentice search is already underway. We’ve had some great applicants already and are starting to set up interviews. We’re still accepting resumes for our full season apprentices (mid-March through mid-November) who will live here on the farm. Check out the job listing page for details. We will be sending out CSA brochures in the next couple of weeks and we expect to sell out quickly even though we are expanding. I wish we could grow enough to meet the huge demand that is happening, but we can’t do it all at once. We’re going to grow slowly for the next few years. If you are not currently a member, but would like to be or just want more information, please call or email us to get on the waiting list and we’ll send you a brochure when they are ready. We will start offering bulk packages of pork and beef in the new year. Rough first dates for pork are in mid-February and again in March and NEW! our grass-fed beef in March. We will be sending out information about these to those interested who are on our mailing list. If you would like to receive this, please let us know! Jesse and Desiree will be giving a family-oriented talk and presentation on the importance of local food and farms as part of the community at the Berkshire Museum on Saturday January 3rd, 2009 at 1pm. Talk will be followed by a craft session making cornhusk dolls and grinding corn into flour. You can find out more information and directions to the museum at http://www.berkshiremuseum.org/. We hope to see you there! Animal News: Pinky had her litter 3 weeks earlier than expected. All the books say that if you put a sow in with a boar 3 weeks postpartum, with her litter still unweaned, then she won’t breed. Unfortunately we forgot to lend Pinky that book, so she didn’t know (and now we DO). So Jonathan walked into the barn one afternoon to discover her calmly and efficiently having her babies with Lucy and Jake in attendance as midwives, but since this is her fourth litter, she can pretty much take care of herself. She has a beautiful litter of 11 healthy, very pink, piglets- nary a spot on any of them, much to our total surprise. The only evidence that Jake had anything to do with their genetics is that most of them have very short, upturned snouts. Only one has Pinky’s long, Landrace nose. They are all of them adorable, lively and curious. Penny decided to wean her large batch of 13 (the runtling stayed with Portia) at 7 weeks by jumping out of her pen to get away from them. Guess she was done. We moved her into Jake’s paddock outside- we think that she’s caught on to the mothering process and will make a nice sow despite the fact that she is a little shorter through the body than is ideal. Her piglets are all healthy, a great size and are easy to handle. The cattle are growing well on all the late autumn grass. We just started feeding out a little bit of hay in the first week of December as walking through the fields, the grass has started to look a little unpalatable. We’re interested to see how they like our silage bales (those white marshmallows lined up in some of the hayfields), but want to hold off giving them out until the fresh grass is really done. The cattle will also be moving in to Cooper Barn at some point this winter, though we need to get on with some repairs and modification to accommodate them. They will be fine out in the fields for a while yet, as the Galloways have thick heavy coats (and would greatly prefer to be outside in almost all types of weather) and all the others have access to sheltering woods to keep them dry and out of the wind. Veggie news: We’ve already begun the planning phase for next season’s vegetables. The seed catalogs have all arrived with their wordy mouth-watering descriptions or bright photographs. We’re exploring the organic certification process whose standards we meet or exceed already, we’re just trying to figure out whether or not the actual label is beneficial to our business. This process has jump started the planning for next year however, which is kind of gratifying, and we are having fun laying out what plants are going to go into which fields and how much we can get away with and whether or not we will have to plow another field (which we do). We are figuring out what we want to grow based on last season’s successes and while there weren’t any failures, we heard from our members when they asked for more of something or wished for a vegetable we didn’t have. It won’t be all that long before we are placing our seed orders, and then getting into the greenhouse to start up our onions. Other new events we are planning for the spring is a transplant sale so check with us when you are planning your home garden (if you have one) next season. We will have vegetable, herb and flower transplants for sale. Or, if you start your own seeds, you can save on shipping and price if you order Fedco seeds with us. If you’ve never heard of this company- check out their website at http://www.fedcoseeds.com/ and sign up to get their catalog, it is a real treat. Education Program: We applied for and received a grant from the Katherine and Winthrop H. Murray Crane Trust to cover the costs of our great Garden Club program at Berkshire Trail Elementary School. It is so rewarding to know that there are other people out there that recognize that this work is great for the kids and the community. We’re almost through the first session, and one of the great parts about receiving this grant is that we are going to be able to extend the program to two sessions per school year instead of just one. It also makes it possible to continue to offer these kids dynamic and exciting curriculum. This session we ground cornmeal, made t-shirts using plants and vegetables, planted garlic and daffodils, and explored outside whenever the day was warm enough. We will be offering more fun events during the winter session in January such as plant propagation, mini-gardens and lots more. The kids have fun and when they are having fun, they are learning and that is the most important part. Posted 11/5/2008 2:48pm by Desiree & Jesse Robertson-DuBois. October has been a busy month for us here at the farm. We’ve had a lot of babies born, seen the last of this year’s vegetables get harvested for CSA and farmstand and had our first snow. The garlic is also finally all in the ground- which is why I’m a little late on this month’s addition. I had to wait for the snow to melt and the ground to dry up a bit before attempting to get those bulbs in the ground. It was our intern, Bobby’s, last task to help me with before leaving us. He’s been a great help this summer, we were thrilled to have him around and we wish him much luck in all his future endeavors. If he tackles the rest of his life’s tasks with as much enthusiasm and good will, happiness will surely embrace him. Animal news: Penny (Pinky’s daughter) had her first batch of piglets on Oct. 7th- 14 piglets, our newest record for live births in a single litter. She was intially pretty freaked out, but her birthing went really easy and really fast. She had all of them in an hour and a half! She went into labor right at the start of CSA pick-up and delivered the last one before distribution was over. Needless to say, we were a little distracted that day. She settled down after we moved Portia, her sister, out of her pen. Portia was the worst doula pig we’ve ever seen. She was too worked up, which is the opposite of how it usually goes. She kept stepping on babies and making Penny more nervous. So we moved her to a separate pen for a few days and let Penny bond with her babes and figure it all out. Turns out that she has only 13 active teats, so that left one poor little piglet continuously out, but she is doing fine, she was adopted by Portia, Penny’s sister after we moved Portia back in with her sister until her own birth three and a half weeks later. We finished the garlic just in time to witness the birthing of Portia’s litter. She had nine piglets on Nov.1 and while she is a bit of a nervous momma we trust that she’ll settle down and do just fine- after all, she had no problem adopting her sister Penny’s little runtling. The runt is still content to live with Portia and her 9 new siblings, we tried putting her back in with her momma, but she just hops back through the fence and snuggles up with Portia. We don’t blame her, at almost four weeks, her much bigger siblings are a rowdy bunch. 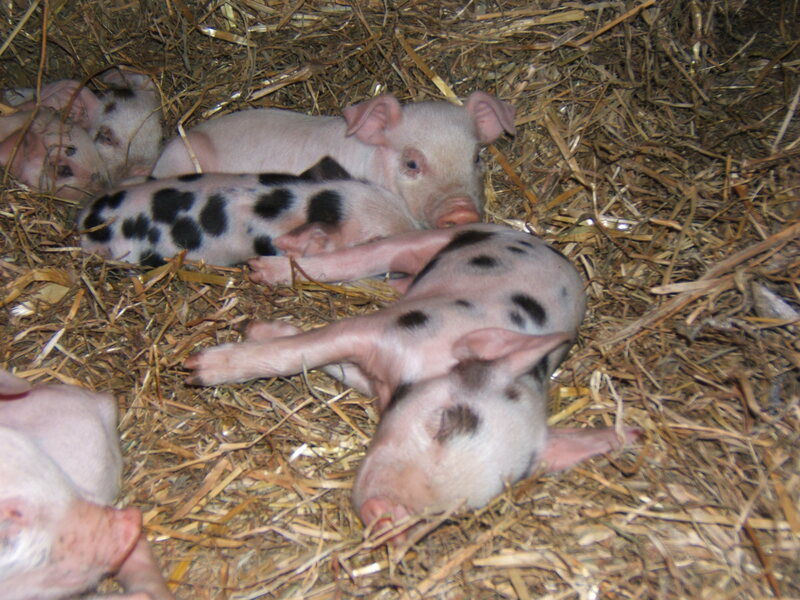 Both Penny and Portia were bred to Jake, so we have piglets with spots! We moved Pinky, Lucy and Jake up to the barn and their autumn quarters, while the weanlings got moved into the field nearest to Rt. 9. The little ones are busy ‘hogging down’ the remnants of corn and pumpkins that were left in the field after harvest. They will eventually move up to the barn for the winter, but we want to leave them out as long as possible since we need to do a little rearranging in the barn to make it comfortable for all the pigs. We’ve added to our cattle herd again. Seven young Hereford-Angus crosses joined the others this month bringing our total up to 22 head. Still a small herd by all accounts, they still manage to make their fare share of trouble while we race to catch up on our fencing. The newbies are lovely, some are spotted black/white and red/white with many carrying some version of the classic ‘baldy’ or white face that breeds true in Hereford crosses. Two of the new calves are heifers, with the potential for staying with us and becoming part of our cow herd. Luna is a black baldy with a dark ring around one of her eyes in a white face and Celeste, who actually looks like an Angus- Jersey cross, she is all black, but very dainty and feminine compared with the blocky Dexters. Loki (nicknamed Lucky for obvious reasons) has come to visit us and Froth, Cassie, River and Brook seem delighted. He’s a very handsome 2 year old bull from Wheel-view Farm in Shelburne. He is very much the perfect example of a Belted Galloway bull, all shoulders and chest with a solid, bright white belt, but he seems gentle and sweet with the ladies. Veggie News: The CSA wrapped up during the middle of October and we are still adjusting to the idea of not getting up early on Tues, Thurs and Sat mornings to harvest. While it would have been nice to continue on till the end of the month, it was a harsh awakening on the last Saturday morning to wake up to a white, frost covered world that stayed that way until 11am, well after the start of distribution. We couldn’t harvest while everything was frozen and so there weren’t many freshly harvested veggies that morning. Folks still walked away with a bulk of storage vegetables- a full share took home 20 lbs of potatoes, lots of winter squashes, onions and more. Sign up for the 2009 season will begin in January, look for brochures in the mailbox starting in December. If you would like to get on the mailing list, email us soon! The farmstand continued until Halloween. We closed up and emptied the sheds, which will be moving up to the farm. The farmstand will be moving up to the sugarhouse for next season- look for the new addition in the spring! The previous farmstand site will be being utilized as a staging area for the Waconah Dam Restoration Project. Don’t worry, there will still be a field of gorgeous vegetables growing next season- the Project only needs the flat, gravel area where the sheds were. Our new signs will be going in directing farmstand customers up to the farmyard and sugarhouse. Most of the fields have been put to bed unless they have the last of the fall crops in them. We are still harvesting some for wholesale to Berkshire Organics and the Creamery. Any that are still open will have to wait for cover cropping until the spring- when they will be planted with oats, peas, hairy vetch or clover until we need them. We don’t ordinarily like to leave our fields open at all- but the lateness of the CSA this season makes it impossible to put in the winter rye- it just won’t germinate in this kind of wet-cold. Next season we plan on implementing a new technique utilized by a pair of Virginia farmers, Anne and Eric Nordell, who interplant their fall crops with a single line of cover crop down each row after the last cultivation but before harvest. This leads to a healthy stand of cover crop while you are still harvesting and it also aids in suppressing unwanted, late germinating weeds. The Education Program started up the Garden club afterschool program again this session at Berkshire Trail Elementary School. The kids are exploring biodiversity, making sunprints, carving pumpkins, and getting dirty again this term. We’re even getting outside and into the garden beds to weed, compost and plant stuff to enjoy in the spring. We also brought some piglets to visit the kindergarten class- Morgan got to be the star of the show and tell all his classmates about pigs. It was great fun to see the kids touch them and then run around squealing and pretending to be piglets. November will see us winding down as the days get a lot shorter and colder, but we will also need to make sure that our animals all are all safe and warm. So don’t be surprised to see us out there in our insulated coveralls, hauling water and feed, heat lamps and bedding. We’ll try and take some pictures. Posted 10/6/2008 2:53pm by Desiree & Jesse Robertson-DuBois. September has passed and as October rolls in the days are getting shorter and the light is lying long and low across the fields as we start prepping for winter. This year we have a lot more animals to worry about keeping warm and hydrated throughout the cold season. We also have more fields to ‘put to bed’ as soon as the last of the veggies are out and the critters housed elsewhere. We won’t really start slowing down for at least another month, but all the same, the early twilight and the seemingly endless (and cold) rain have been driving us inside earlier and more often than before. And so we catch up on all the little things that get pushed by during the season; the book-keeping, returning phone calls to friends and customers alike, and we even start putting up some food for ourselves for the winter. We make jams of all kinds, tomato sauces and freeze fruits, veggies and greens. While we wish that it was enough to get us through the winter without needing to see the inside of the grocery store, there is no way that we could put up enough to fill all our nutritional needs. It is tough when you work all day with every pot you own bubbling away on the stove containing literally a bushel (or more) of tomatoes, red peppers, eggplant, garlic and onions, only to finish the whole canning process to find exactly 6 quart jars of sauce sitting on the counter for all your effort….and then your husband walks in and says, “great, those look beautiful, but we need, like, 60 of those to get us through till tomato season next year.” sigh. And we again feel a deep appreciation for the generations of women who did exactly that year in and year out for themselves and their families. And now there are two bushels of apples sitting on the counter. Farm news: Hillside Engineering are surveying the farmyard in preparation for the new barn and sugarhouse addition coming next spring. While they are in and out in a day or so, they will be helping us to site the new barn which involves some serious earth-moving. It turns out that we need to level a chunk of the farmyard in order to build the new barn- this is a huge amount of excavating, but it will actually solve many of the drainage problems that we have at the farm (such as the draining of the farmyard, literally, right into the main alley of Main Barn or into the road which runs between Main Barn and the Round bale barn- where is ends up leaching into the stalls on that side of the barn….yuck). We probably won’t get into this until the spring, but it is nice to see the process getting started. Another interesting event in the last month is that we worked with Berkshire Grown and took all their food waste and compostables from their annual Harvest Dinner. They even bought in biodegradable tableware and used unbleached plates, napkins, bowls and cups. We are also working with Central Berkshire Regional Schools to collect the food waste from the three elementary school cafeterias. We’re very excited about this project even though it is still in its infancy- we hope to be able to expand it to include middle schools and high schools. Composting the food waste is way better than watching all that fertilizer go into the landfills. Animal news: There is still a lot of winter prep to do for cattle, pigs and chickens. This is going to involve some new fencing and renovations to Cooper Barn (near the Cottage) and to the existing pig barn. The cattle will be moving to one side of Cooper Barn, where they will have access to shelter from the wind and lots of solar gain. The girls grow nice furry coats and their breeds hale from the wet-cold of Scotland- the snow just adds insulation, so unless the day brings wet and wind, they probably won’t spend too much time inside. The boys aren’t so lucky and will want a dry spot out of the wind and all types of cold weather. The south side of Cooper Barn can easily accomodate our small herd and with a little renovation and moving of other stuff, make it suitable for horses and cattle. We moved Penelope (Penny) and Portia up to the barn as soon as the weather turned cold and bitter since Penny, at least, is due to have her first litter of piglets any day and we didn’t want to lose any to hypothermia with it being so chill. We were surprised that the walk up from the pasture didn’t send her into labor, but she’s still hanging in there, looking incredibly uncomfortable, but warm in her new stall, snuggled into at least a foot of dry oatstraw. The other pigs will also move to the barn later on- for the moment they are still in the pasture and happy to bask in the sun (when we have it) and root for worms and grass. The poor chickens have had a real time of it this year. First it was a fox, then coyotes, and now it is an owl. Somehow I just wasn’t concerned that the Barred owls that I had been hearing in the woods would ever be a problem. They aren’t very big and we had never had trouble with them before, only with their cousins, the Great-Horned Owls. However, it seems that the Barred is indeed the newest murderer of chickens. They have also managed to do more damage than any of the other predators to the ‘Chicken Pysche’ and they have pretty much stopped laying eggs. CSA & Veggie news: The CSA is winding down to the last few weeks and while the fields are still looking full of veggies, there really isn’t a whole lot left. The winter squash harvest went great and we got in all the Delicata in one big swoop. The rest of the squash- the Sunshine and other Buttercups, went a lot more slowly without all the wonderful help and company. The big potato harvest is planned for this coming Saturday, the 4th and we’re hoping for nice, dry weather and many hands to pick up potatoes and load them into bags. Another big upcoming job is the garlic planting. We’re tripling production of garlic for next summer and that means we have 3 big beds to put in this fall. If only we had as many helpers as we did for the garlic harvest! In any case, traditionally garlic is planted right around Columbus Day, but we’ll be waiting on the extra garlic seed to get the other two beds in. We also put in and received our first Buyer’s co-op order this past month and while there are still some bumps and kinks to work out in the system, we’re very excited about actually getting this started. I’m one step closer to eliminating trips to the grocery store and hopefully, I’ll save some money to boot. Posted 9/1/2008 2:59pm by Desiree & Jesse Robertson-DuBois. Despite the coolness of what is usually known as the ‘dog days’ of summer, we’re still having an abundant harvest. The tomatoes are pouring in and taste fabulous, and the CSA and farm-stand is packed to overflowing with gorgeous vegetables. A little more heat would be welcome to keep the eggplant happy and redden the peppers, but then the farmers, plants and animals would wilt so we are careful for what we wish for. The cool, wet days have led to an overabundance of weeds and little time to keep them under control, but the grass has grown like mad, making for beautiful second cut hay (when we can get it baled and in the barn). Our dear friend and professional photographer, Leigh Van Duzer, visited in the beginning of last month and took lots of stunning pictures of the farm and the various activities that are happening here and we would like to share them with you all this month. All the pictures in this month’s newsletter were taken by Leigh. Now the farm is a beautiful place and Leigh’s pictures just make it shine, but she really specializes in pictures that find the beauty in the everyday and most often in things that the rest of us have given up for lost, ugly or falling down decrepit. We think she has a real gift for making you start to look for beauty in the world around you and most especially where you don’t expect to. You can see more of her work at www.leighvanduzer.com. Animal news: We are expecting more piglets by the end of the month. Penelope and Portia are both due with the earliest possible birthdate of the 27th. We are pretty sure that Penny will be first, as she has been getting very round. Our new boar, Jake, the Gloucester Old Spot, is the sire. They will be born out on pasture, so it will probably be a similar situation as when Lucy gave birth- it was a surprise that we woke up to one morning. At 27 pigs in the pasture, we are moving them a lot and they are really turning over the field. Meanwhile, back at the beginning of the field, where they first started out at the start of the summer, the grass grew back thick and lush and the cattle have been loving it. Our little calf, now almost two months old, is growing fast- still cute as anything, but getting much more adventurous. He doesn’t spend as much time glued to his momma as he used to and has been caught a couple of times exploring outside of the fence. If you haven’t had a chance to see them, the cattle are now on the hillside to the left just after you go over the bridge at the farm entrance and will be there for the next couple of days, at least. They will be followed through that pasture by the chickens, who will finally be able to fulfill their ‘pest control’ duties by scratching up the cow pies left by the cattle. Speaking of the chickens most of the new hens are finally laying, but we’re still behind on eggs. The CSA goes on until the middle of October, and then we will again have retail eggs available at the farm and also through the Old Creamery in Cummington. Farm news: Getting the hay in. After weeks and weeks of not being able to get much hay in the barn due to the seemingly endless rain (during which time we pushed a couple of times and just barely made it only to gamble on a 1000 bales and lose one afternoon), the end of the month has proven to be wonderful for haying weather. Our second cut looks beautiful (thanks to all the rain) and we just keep putting more and more bales in the barn or sending it off by the wagonload to other barns. We are sold out of all types of our link sausage and boneless small roasts, but we still have other great cuts available. However, many of our more popular cuts are going fast. If you have wanted to try our bacon, get some soon or you’ll have to wait until we have a harvest date for the two Old Spots that are ready to go. Our hams will go quickly once the holidays arrive- we suggest that you get your ham now before they are gone. These are not huge hams but are instead the small ‘half’ hams. We also have smoked hocks for pea soup. Veggie and CSA news: CSA veggies are looking fabulous. New items this year including sweet corn and edamame (edible soybean) have met with great success. We will also have some new winter squashes that we are excited for folks to try. Summer veggies such as summer squash, green beans, basil and cucumbers are quickly fading, but we will have tomatoes, cherry tomatoes and many other delicious offerings around until frost does them in. We’ve started some salad mixes, broccoli, kohlrabi, fennel and spinach for fall offerings and plan on adding cilantro to the mix. We’re hoping to go until at least the second week of October this season but would like to go longer if the frost and disease holds off. The farmstand is picking up- I think that we cut a little into our customer market by growing the CSA, but we are getting more and more folks every week. If you know of anyone who is looking for fresh local veggies, let them know where we are and when we are open. Thank you again to Leigh van Duzer for all the wonderful pictures. Posted 8/6/2008 3:05pm by Desiree & Jesse Robertson-DuBois. July was hot and wet-we’ve had some incredible storms here in the Northeast. We remain lucky in that while we have gotten an amazing amount of rain, we have avoided anything more intense. One major power outage, lasting almost 20 hours, had us scrambling for a generator to keep the freezers cold and bringing up water for the animals from the river because when we lose power we also lose water. The farm hasn’t really had to worry about extended power outages for a long time, but this one really brought home the realization that while we can go without power for some time without too much personal inconvenience-we have a lot of animals that desperately need to be kept well watered, especially the nursing cows and sows. The cows can get their own water from the streams, but the hogs and chickens desperately depend on water being brought to them for drinking. The hogs also depend on water for ‘mudding’ to keep them cool and protected from the sun since they can’t sweat and their skin burns just like ours does. No water also meant that we couldn’t wash vegetables for our Saturday CSA vegetable distribution- which our members gracefully understood, but it was one more stone on the wall of ideas that we have had for some of the various alternative energy resources we could get going on the farm. Hancock Shaker Village, before it became a museum, relied on water power to run many of its industries on the farm, from the dairy to the woodshop. They built a reservoir one mile away and up from the farm in order to have gravity-fed water power, now….we have a reservoir on the farm- about a mile away and up the mountain from the farm and we are presently researching small-scale hydro-turbines. We also have a constant breeze blowing through the farm like it was a giant wind tunnel, perfect for a windmill, which wouldn’t generate enough power for the whole farm’s needs, but would go a long way towards alleviating some of our huge energy costs. I mean, why not. If we could provide our own clean power on the farm or at least generate part of it-it would help the farm and the world. Anybody know anything about any of these subjects? Any advice would be welcome. CSA & Vegetable news: I love seeing so many folks out in the Pick-Your-Own garden right now, even though the peas and strawberries are gone, the green beans were ready right on time to replace them and there were always lots of flowers and basil and other herbs and it just made me smile to see so many people enjoying themselves. Even some of the cattle escaped to come up and see what all the ruckus was about (though they found the newly growing buckwheat cover crop to be far more exciting that the flowers). The members seem really happy with their weekly produce-at least, we haven’t heard many complaints. August is when the season really gears up and moves from mostly greens to lots of fruits (though we still have greens) such as summer squashes, cucumbers, tomatoes and sweet corn. Desirée is gearing up her ‘Ze-a-lator’ with Bt and veggie oil to keep the baby corn worm-free and hopes to have corn in the next couple of weeks. Fall crops are still getting transplanted and started outside the greenhouse. The first of the fall cabbages, broccoli, purple pac choi & kohlrabi went in last week along with some trial runs of green and red-veined sorrels. We also started some fennel, but that proved to be too irresistable to either birds or rats and they totally destroyed it. We’ve broken out the covered benches that Jesse cleverly designed to keep out the critters and we haven’t had any repeat destruction. Fall transplants are tricky to get going as the sun is very hot this time of year and seeds don’t like to germinate, but we’ve found that it works well to start them outside in soil blocks in solid bottomed flats (which hold moisture longer than the more open lattice bottomed flats) and then keep them covered by the lattice bottomed flat until the seeds pop makes for healthy germination and less likelihood of ‘stretching’ in the seedlings. We also always cover the seeds with at least a light coating either vermiculite or potting mix. We have to be careful to keep an eye on them so that they get uncovered as soon as we see the seedlings popping out of the soil and don’t get too dry. We’ve had our seedlings go through some pretty heavy thunderstorms where we were sure they were washed out or lost to drowning only to be pleasantly surprised to find them happily germinating in their appropriate blocks. Animal news: Our first calf was born on July 24th to Cascade. He’s a ¾ Galloway to ¼ Highland cross, and to prove it he has a ¾ belt around his middle like a big ‘C’. We totally missed his birth which happened when we weren’t looking (in fact, it happened somewhere in a less than hour and a half period between checks, it was as if Cascade was just waiting for us to disappear and leave her alone long enough to have her baby, get him up and nursing just so that she could give us the look that says ‘harumph, I definitely didn’t need your help.’) Cascade is proving to be a great mother- she’s hiding her calf in the tall grass like a pro-she is doing it so well that we’ve had a couple of scares until we realize that he’s less than 10 feet from her, though you practically have to be right on top of him to know. He’s a total ham- he scampers and capers around doing little dances- as long as he doesn’t know that you are watching, if he sees you he hightails it back to his momma like a shy little puppy. We moved Pinky and her dozen piglets out onto pasture for the first time this month and they have all integrated well with the others. That makes a total of twenty piglets out on pasture, total number of pigs in the field is 27. We’re getting quite a sizable crowd out there. Pinky is particularly happy to be out of the barn. This is the first time for her in her life. She always had a large outdoor run, but this is the first time she’s ever had access to lots of sod, grass and earthworms that just keeps repeating itself everytime they get moved to a new spot. The young pullets (born on March 3rd) have just started giving us a few tiny eggs, but that is a great sign. It means that we will soon have good-sized eggs available for sale and will no longer have to keep turning our friends and neighbors away when they come looking for our ‘tasty’ eggs. It also means that Desiree won’t have to continue to stress out that she won’t have enough to give to our CSA shareholders who bought eggs in advance. It has been quite an experiment, but we’ve learned a lot and the main thing is that we can’t really have too many hens. So we will increase the numbers again next year. We went looking for more hens and realized that they are few and far between, but we lucked into some lovely 10 week old pullets- Aurancana and some (what we can puzzle) are Silver Leghorns. They won’t give us any eggs for another 3 months or so, but it will be a good thing when they do. That brings the current flock size up to about 145 birds or so, but we will have to say good-bye to some of our older ladies in the later part of the fall. We will probably offer them to folks who would like some home layers who don’t lay every day, but still give 4-5 per week. What’s available at the Farmstand? The farmstand is open four days a week (barring the occasional labor shortage)- M, W & F from 3-6p and Sat from 10:30a-3p and we have a nice array of veggies, dressings, jams, maple syrup and blueberries. Vegetables include: fresh lettuces, summer squashes and patty pans, zucchini, cherry tomatoes, new potatoes, cucumbers & swiss chard. We will soon have organically managed sweet corn and heirloom tomatoes, eggplant and peppers. We will be working on getting the electric installed at the stand so that we can carry our pastured pork cuts, bacon & ham along with some other locally produced cheeses and yogurts. Unfortunately we haven’t been able to procur a good source for local breads, but plan to keep looking. Other Farm News: We’re making lots of hay this year, despite the frequency of the rain. We got a new round baler and it is making all the difference. Lots of cattle and hopefully, sheep, means that we could really utilize a lot more of our own hay right here on the farm instead of trying to sell all of it. So we are also borrowing a friend’s round bale wrapper to make our own silage bales. You’ve probably seen them at some point in your travels, they look like bright white marshmallows piled and lined up along the edges of fields or barns, particularly dairy barns. Well, these are round bales of hay that have been baled slightly wetter than would ordinarily be recommended (since wet hay usually equals rapid decomposition- so rapid that they can catch on fire), but because these bales are then sealed in plastic the anaerobic environment makes it perfect to grow the right lactobacillus bacterias to literally pickle the grass inside. Wrapping some of our bales has really been a Grace this summer- with all the wet days we haven’t had as much drying time as we’ve needed to make as much good first and second cut hay as usual- but they’ve worked well to make these silage bales. Posted 7/9/2008 3:12pm by Desiree & Jesse Robertson-DuBois. The end of spring and the beginning of summer has brought lots of rain to our farm fields. It has been a challenging month for many aspects of the farm- except for the animals, however- they prefer the rain over heat anyday. The pigs wallow in mud puddles and the cows ease through the wet grass, munching and appreciating the coolness it brings to their long black coats. The chickens are a little less pleased by wet days, tending to look bedraggled and look to hide under their house, but they are out the moment it stops to look for worms, slugs and other protein-filled bugs brought by saturated ground and wet grasses. Where we feel the lack of dry days is in the overwhelming amount of weeds that invade the vegetable fields and in the empty bays of the hay mow. The first cut of hay should have long been mostly put in the barn or shipped off to various other farms in the area and we should be working on trying to get the first of the second cut in, but, without the pre-requisite three days of sun (or two hot and windy at the very least), we simply can’t make hay. So on it grows, grasses now tall and leggy, seed heads filling out and heavy with seed. We had hoped to bring in a couple of other fields this summer, but it looks like we may not get to them unless the weather starts to favor us a little more. We are also starting to get bogged down by out of control weeds in some of the veggies- they simply won’t die- we pull them out or cultivate by tractor or by hand and then we have a lovely afternoon (or all day) shower/thunderstorm/just plain rain, rain, rain and the weeds happily re-root and grow even bigger. We have been lucky however, we did not get any of the devastating thunderstorms with hail and damaging winds that some of our fellow farmers have had to suffer through. So far all the veggies are flourishing, along with the weeds. CSA News: Distribution is entering its fifth week and is going well. We are trying to offer something new each week for as long as we can, all the while supplying our members with familiar offerings. So far, we have heard lots of favorable comments on how delicious all our fresh veggies. We love seeing everyone come to the farm- one of my favorite things has been watching people wander among the strawberries and peas in the Pick-Your-Own and hearing the delighted squealing of laughter from the children who are eating those peas and strawberries faster than the adults can pick them. We’re slowly getting to know faces (names always take a little longer). I love this model of CSA, where the members help with at least two distributions through the season, sometimes they help with some harvesting and setting up, but mostly they are there to meet and talk with other members as they come to pick up and I just love watching those connections happening. It puts the ‘community’ into CSA by building it from scratch through the farm and how wonderful it is to be a part of that. Animal News: Well folks, the hens just aren’t really laying….and I can’t really figure out why. The best I can come up with is that there are a bunch of different small stresses that have combined to make them stop laying. I can only hope that they will pick up again in a couple of weeks or so. What could stress out a chicken? Well, they are out of the barn and into their new house but we also combined them with the new flock of young birds, hence strangers in their midst. Feather mites are annoying some of the older birds. Lots of people and dogs are constantly looking at them all the time. Predators- there is a nice healthy fox who checks out the fence periodically (though it hasn’t gotten in for a while), a weasel has been sited near the coop with an egg in its mouth, owls & hawks are always watching and who knows how many other stresses unknown to me are also affecting them. All I know is that they are in reasonably good health (for chickens), seem very happy and yet, are not laying enough eggs. C’est la vie. The cattle have happily settled in and are munching their way through acres of grass as we speak. Currently they are down in back of the floodplain field where they have free access to water and shade and browse in addition to grass (browse is defined as trees, bushes and shrubs- woody stuff- that they enjoy eating along with grass). There are fourteen cattle total- four heifers are the start of our beef herd breeding program and they come to us from Wheel-View Farm in Shelburne, MA. They are all Belted Galloway-Highland crosses. Three are one year olds, River, Brook & Froth, and the fourth, Cascade, is two and has a calf due in another couple of weeks. The other ten are Dexter steers, one and two year olds that come to us from Morning Face Farm in Richmond. We will be able to start offering grass-fed and finished beef in the late fall. Pinky gave birth at the beginning of June to a DOZEN healthy piglets. They are all growing well and will be weaning in the near future, though probably not before they move out onto pasture with all the others. Des played midwife to Pinky again- the last piglet had a little trouble getting its breath, but a lot of rubbing and encouragement brought it up to par with all its siblings and it is now impossible to distinguish it from them. There are six girls and six boys in this litter- whoo hoo! Pinky’s first daughter, Lucy, also gave birth on June 27th to eight piglets. This was our first pasture birth! She didn’t need a midwife and did it all on her own so that the piglets were a bit of a surprise for us in the morning. She’s a good and protective mother and though a little aggressive at first, she seems to be calming down fine. Farm-stand: The stand is now open four days a week- M, W, & F from 3p-6p and Sat. from 10a-3p (or so, sometimes if we are working out in that field, we’ll keep it open as long as we are out there so you might find us open later than 3). We DON’T have sweet corn and tomatoes yet- not for another month or so at the earliest (we don’t live in Georgia here folks), but we do have some lovely lettuces and salad mixes, early summer greens such as tender kales, swiss chard and collards. We also occasionally have scallions, salad turnips and beets. Upcoming are new potatoes, cabbage and flowers. We are also starting to stock some locally produced accompaniments such as Appalachian Naturals dressings, sauces, dips & salsas and some local jams. You can also get our farm-made maple syrup, compost and such at the stand. We hope to add other lovelies as they come available. We are working on getting our pork down to the stand, but need to hook up the electric. Until then you can buy our pork out of the farm office, during CSA pick-up or from the Thursday afternoon Pittsfield Farmers’ Market on North Street (4-7p near St. Joseph’s church). We just got a whole new batch of pork cuts in, including new item- link sausages in sweet & hot italian and breakfast). We also have picnic shoulders available for backyard pig roasts.